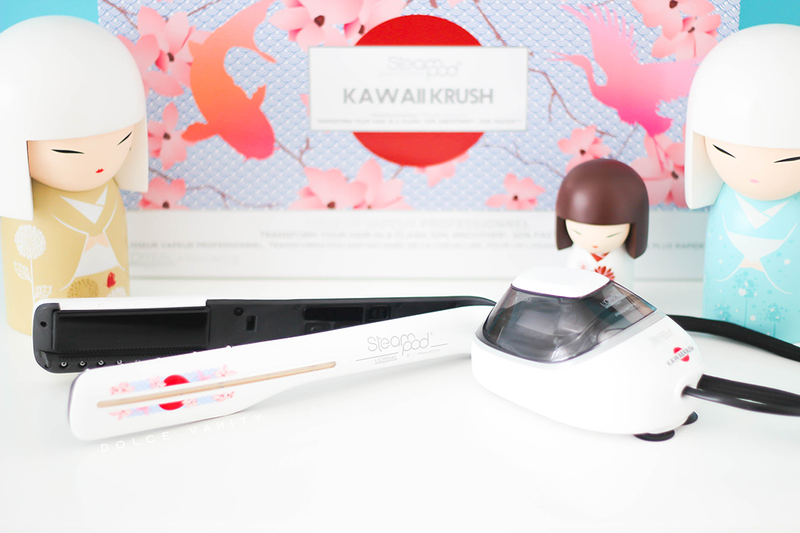 L'Oreal Professionnel New Generation Steampod 2.0 Kawaii Krush LE. When it comes to cooler months, I don't mind wearing my hair straight because there's less humidity and therefore the press lasts a lot longer than it would in more humid temperatures. When I decide to wear my hair straight, I will do my usual haircare routine but I will then section my hair and blow dry my hair to stretch out my waves to lessen the tension and heat that I have to use with the straighteners as I will ideally only have to do a one pass over each section (keep in mind, I will do very small sections so each strand has a chance of being passed over the iron). Now the L'Oreal Steampod 2.0 (the one featured is a limited edition 'Kawaii Krush' design inspired by Japanese pop culture besides that everything I'm going to tell you is the same as the original 2.0 version) is a product like no other and one I've never tried on my hair, to begin with, this uses a combination of steam and pro-keratin technology, that'll help tame hair movement, leaving it silky smooth whilst protecting from heat damage. Hello!! WTF!! When I think steam after I've pressed out my hair, listen girl. I am out of there, who is sweating out this blow out? Not me BUT here's where the difference of this steampod comes into it, this is actually opening the cuticles of our hair and putting the moisture back in that heat takes out. So it's basically telling me my hair is going to be smooth, shiny, hydrated and bomb AF!? I feel if this works out it would be an Oprah moment and I want to say, YOU GET A STEAMPOD & YOU GET A STEAMPOD AND YOU AND YOU AND YOU! But, I'm not Oprah, so...don't hold me to that promise😊! What is the L'Oreal Steampod? 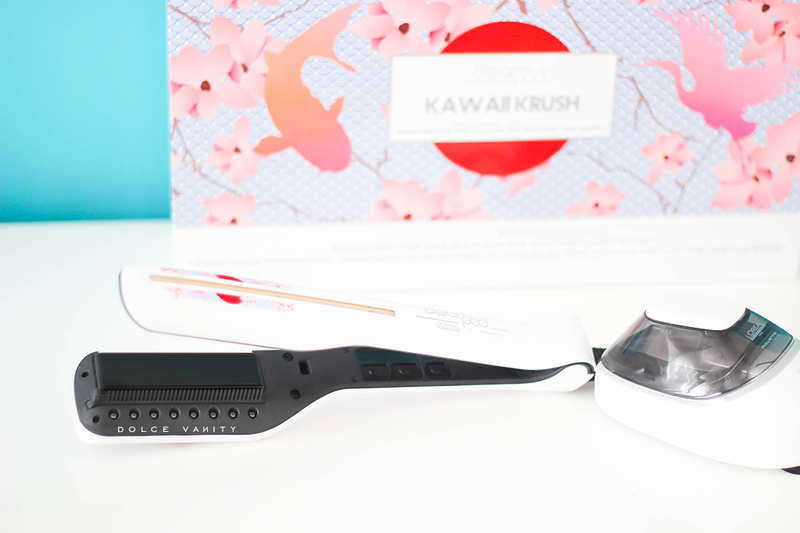 This hair styler tool is powered by steam, used mainly for straightening hair but you can also create loose waves & curls. 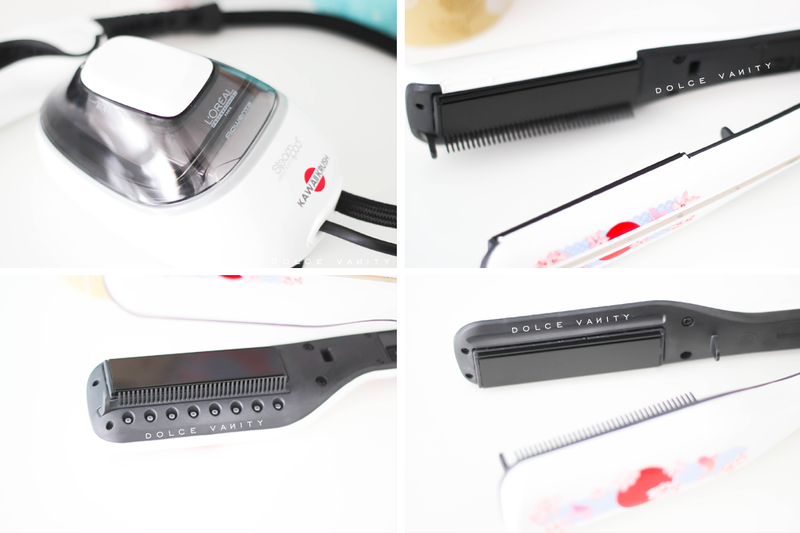 There are 2 versions and the updated one comes with a water demineralisation filtration system, five temperature settings (140-210°C), anodised floating plates, a removable comb that helps to detangle and smooth hair with each pass and it's smaller & lighter. How does the L'Oreal Steampod work? The Steampod uses a continuous flow of high pressure steam to straighten & style the hair resulting in a glossy and smooth finish. Water in a pod is heated up to create steam, that is passed through the cord of the straightener, the steam comes out through the steam outputs and into the hair. Allowing the hairs cuticles to open up and receive the nourishing products to penetrate deeper - it's like me doing a deep steam on my hair but during the finalised step. It'll keep hair straighter for longer. 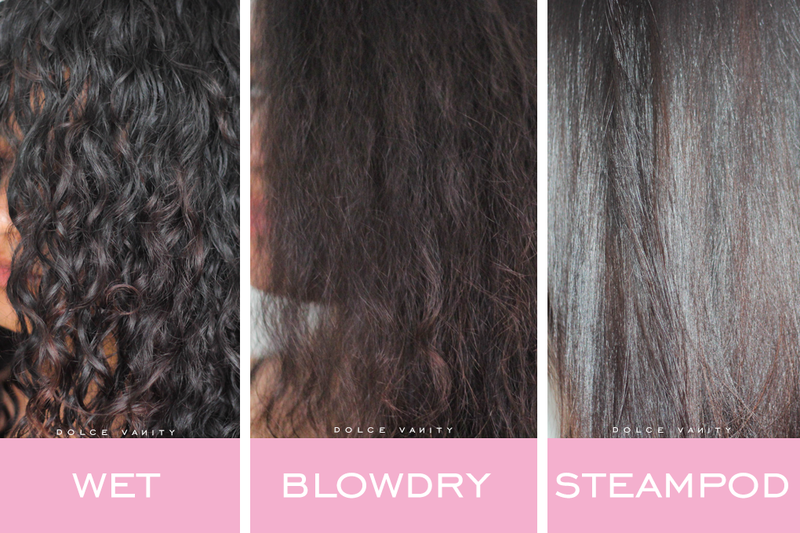 L'Oreal claim the results using the Steampod are up to 50% faster and 50% smoother than a regular straightener & with the steam being indirect heat, it's a lot easier on the hair than regular straighteners. My hair type is medium density but fine. My hair can range from waves and curls but it's very loose and when straight, very light and flyaway. But like a lot of women, I enjoy switching up my hair occasionally and as I'm off the colouring, playing with the versatility I have is my fun. This September, I've been wearing my hair straight but before the Steampod, there was a couple of session after a wash and deep condition that two types of heat was used. Eager to see the differences between regular straighteners and the Steampod. I did all steps I normally would do if I was straightening my hair. I put serum or an lightweight oil in before I blowdry, then a bit more if it's too dry because I prefer to put in as I go than have too much and have weighed down hair. I put water from a water bottle up the the max line and switch it on, (the water tank, slides off the pod to make it easy to fill up and to get rid of the excess water when finished) as it begins to heat up, there's burst of steam. I sectioned my hair as normally and begin from the back. Now I find that I do have to lower the heat around the nape of the neck where the hair isn't a thick and there's a lot more baby hairs. But I can push it to 200 - 210 as I move forward. Holding the straighteners following the directions of the arrow on the appliance - basically the comb must be at the bottom, as you put your section in and begin to close the steam comes out and then the hair connects with the plates. The steam is already putting the moisture back into the hair and the plates will close and lock it in. To be honest I was quite surprised at the results. 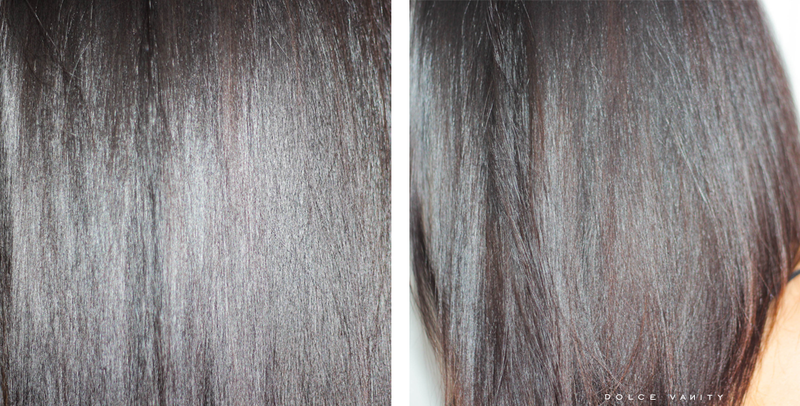 It took me less than an hour to do my hair and once finished I would also put more serum in. It's a lot bigger than most straighteners, also I like thinner ones to get around my hairline quicker, this can do that but with the steam it can hot with the burst of steam. If you travel often and like to wear your hair straight, then these aren't the most travel friendly due to the size but I could see a lot of people trading their normal straighteners in for these as, it really does promote shine and my hair smells just like it should. Without a doubt I can feel and see the benefits that it claims.. I think these just became my crowns new FWB! LOL! Samples. // Outward Links Are Affiliate. Wow I need to try this the results look amazing! Your hair does look great. I would love straight hair but I just don't think I would have the time...do you go a few days without washing it once you've done it? Dry shampoo? I don't do anything to my hair as it's poker straight anyway but I love the look of this! Wow, your results are so impressive. I usually tend to believe that no hair tool can make my hair look as great as a trip to the salon, but wow - this is just fantastic! Your hair looks amazing! My hairdresser has started using the Loreal Steampods and they are brilliant. I love the design of these ones though, they are so pretty and girly. That has actually given such a gorgeous result. I have been looking for something like this for my hair. I think I must go and check this out.